After the performance he put on last spring during the Chicago Blackhawks' run to their first Stanley Cup in 49 years, when he seemingly emerged as one of the top young power forwards in the NHL, one would expect Dustin Byfuglien would have little interest in ever switching back to defense again. That was hardly the case. 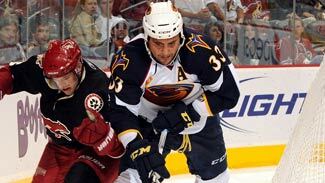 When he was acquired by the Atlanta Thrashers in a major trade over the summer, GM Rick Dudley immediately approached Byfuglien about returning to man the blue line. Not only didn't he meet any resistance, it turned out Byfuglien was a fan of the idea. "When I got traded, right away we talked about going back to defense," the 25-year-old Byfuglien said. "I think it's just the confidence and just the ability to be able to realize you can take your time, shoot the puck and just get it on net." When the NHL selected the teams for the 2011 Bridgestone NHL Winter Classic, hockey fans were treated to the promise not only of another memorable outdoor game before a packed crowd on New Year's Day, but also to what is widely regarded as the top rivalry in the sport today -- the Pittsburgh Penguins and Washington Capitals. Of course, a lot of the hype centers around the head-to-head rivalry between the game's biggest superstars, Sidney Crosby of the Penguins and Alex Ovechkin of the Capitals. "[Crosby] is a great player. He's the face of hockey, especially in Canada," Capitals coach Bruce Boudreau told the Pittsburgh Post-Gazette last year. "Alex is a great player. He's the face of hockey in D.C., for sure." An in-depth interview with one of the game's top rising stars. NHL greats discuss their collegiate experiences on the ice. Close look at the Tampa Bay Lightning as their prepare for as Playoff run. Recognizing the winner of the King Clancy Memorial Trophy.